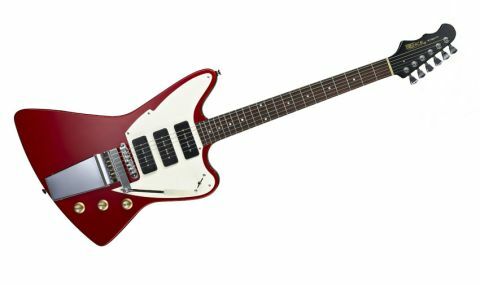 Okay, Wilkinson snaffled some cute design cues from the old non-reverse Firebird, but the Esprit III has a sound and feel of its own. Stonking range of tones. The chunky neck. All that eye candy! The reverse headstock makes the tuners harder to reach. The latest addition to Trev Wilkinson's intermediate Fret-King Black Label Series is a beautiful take on a 60s classic, dubbed the Espirit III. The guitar is fitted with Trev's Vari-coil control, which enables you to dial out a proportion of each pickup's windings to reduce the output of the WP90 single coils and pull single coil-like tones from humbuckers. Let's take a closer look. "The Esprit III is not a direct copy. Its three-piece agathis body is a fair bit deeper than that of the 60s 'birds"
You don't have to be a crime scene investigator to detect a trace of Gibson Firebird/Explorer DNA on the Esprit III. We're talking specifically about the non-reverse 'birds that flew out of the old Gibson factory in Kalamazoo, Michigan between 1965 and 1969. The Esprit III is not a direct copy, though. With its altered profile, the three-piece agathis body is a fair bit deeper than that of the 60s 'birds, giving this guitar a robust feel when it's hanging from a strap. The Esprit's gloriously deep yet supremely comfortable D-profile neck is glued to the body and topped with a rosewood fingerboard studded with 22 medium jumbo frets. The 'board's 254mm (10- inch) PRS-standard radius puts it between the feel of a modern Fender (241mm/9.5 inches) and a Les Paul (305mm/12 inches). The power trio of Wilkinson WP90 single coils are stacked to reduce hum and, as with the other two guitars in this review, wired to a five-way lever pickup selector switch, a master volume, master tone and Trev's smart Vari-coil control. The icing on the Esprit III's cake is the Gibson Maestro Vibrola-style vibrato unit, aligned with a chunky chrome Wilkinson bridge with six roller saddles to help with tuning stability. "The bridge unit sparkles when clean and roars when overdriven"
Wilkinson's take on the classic P-90 has found the perfect home on the Esprit III. The bridge unit sparkles when clean and roars when overdriven. The in-between positions work great for blues noodling and sweet slide phrases, and we love the unexpected psychotic reaction of the middle position, especially in conjunction with some nasty germanium-fuelled fuzz. We can now welcome the Esprit III to our good books. It scores big in looks, tonal range and playability. In other words, if you haven't done so already, the time has come to see what all the fuss is about.